I used this idea a few years back when planning a Scandinavian party for my school's performing group and they turned out to be the perfect little touch to all my table settings. This is an easy little craft project that you can use over and over again. All you need to do is go to DI (or any local thrift store) and search for a few cute plates and different candle holders. Any style, make or color works - use your creativity! 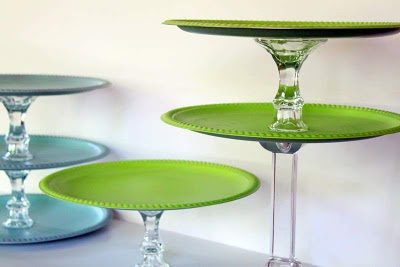 Simply hot or super glue the bottom of the plate to the top of the candle stick. It's literally that easy. 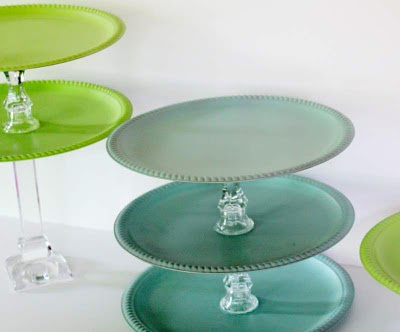 Paint the plates or add ribbon around the candlestick holder for a little pizzaz and voila, you have the perfect trays for any occasion at little cost and effort.